Sorry, but no child discount on this tour. To reserve a seat for this tour you must pay a $100 deposit per person. Remaining balance is due latest June 21st. If the remaining balance is not received by June 21st, the reservation will be considered cancelled with loss of the deposit. We will start our tour at 7:30 am in midtown Manhattan, 8th Avenue between 33rd and 34th Street (by Duane Reade) DON'T BE LATE! Come 20 minutes early to sign in. You will be greeted by your tour guide for the day. You will sign our liability waiver, and after departure a light breakfast will be served on board the van. The Finger Lakes is a group of 11 long narrow lakes in Upstate New York. The lakes shapes reminded early map-makers of human fingers so the name stuck. The largest lake, Seneca is also one of the deepest in the US at 618 feet. It is 38.1 mile long. This region is a must-see destination for any outdoor enthusiast with many impressive State Parks, wineries and it’s a waterfall mecca. We will visit four of the most impressive State parks in New York, one local park and a winery. To make this tour affordable for everyone, we will choose a basic but comfortable 2-3 star hotel with a minimum Google and Tripadvisor guest rating of 3.5 (on a 1 to 5 scale). You room will have a refrigerator, microwave, coffee maker and hair dryer, along with an iron, ironing board, and with free Wifi. In contrast with our Catskills Weekend Tour where we stay at a resort, the hotel we will stay at on this tour will have very few amenities, but our days will be full of activities. 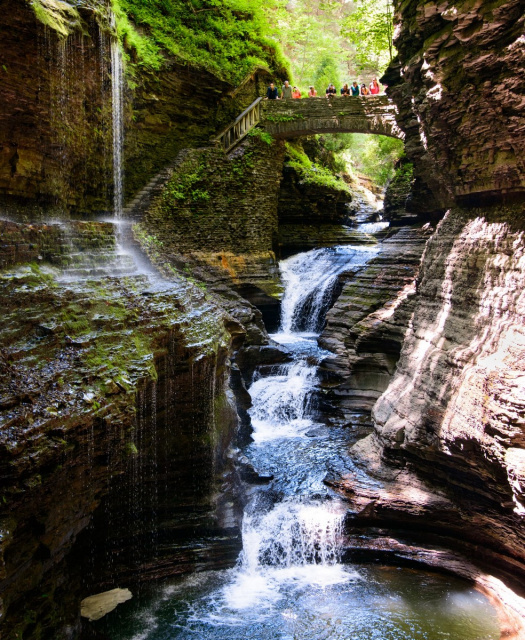 This is the most famous State Park in the Finger Lakes Region. The park is a two mile gorge descending 400 feet and within a mile’s stretch you will experience 19 waterfalls. This park has been voted the third best in the country, out of more than 6,000 State Parks. The gorge trail winds over and under waterfalls and many places you will feel the spray from the falls. 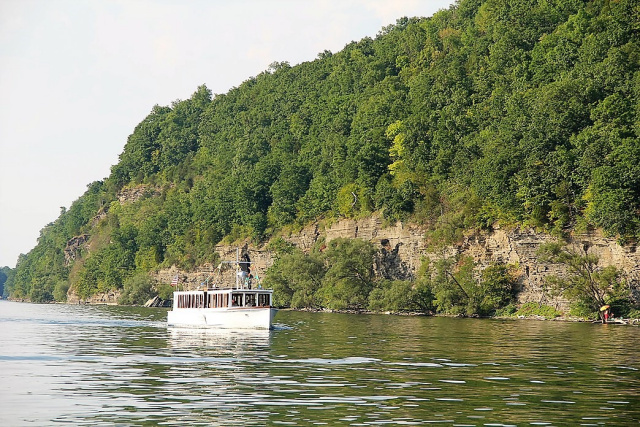 If you don’t feel like hiking, you can at you own cost join a cruise on lake Seneca for $18. Or you can stroll around and explore the village and marina of Watkins Glen. This park is home to one of the most outstanding natural attractions of the Northeast the Taughannock Falls. This Falls plunges 215 feet past rocky cliffs that tower nearly 400 feet above the gorge. This is the tallest single-drop waterfall east of the Mississippi. We will indulge our self in an easy hike (1.5 mile roundtrip with almost no elevation) along the Taughannock Creek to a viewpoint by the base of the falls. On the trail you will also experience a 20-foot (6.1 m) cascade, known as Little or Lower Falls. We will also drive to a second much higher viewpoint of the falls. If you don’t feel like hiking, you can enjoy Cayuga Lake Beach. Here you can relax and swim or at your own expense rent a paddle board, a kayak or a canoe. A visit to Finger Lakes Region is not complete without visiting one of the 100 wineries, breweries and distilleries. 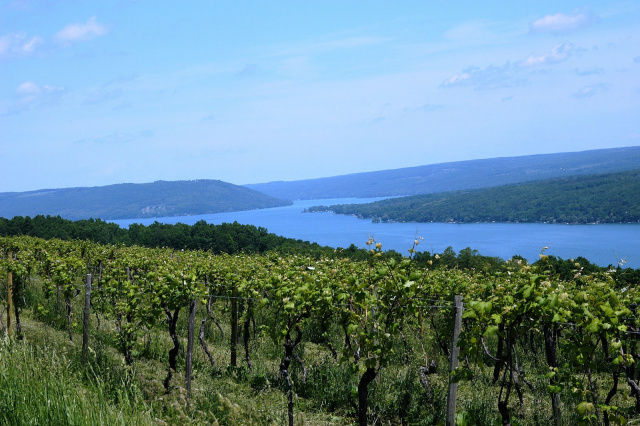 The Finger Lakes is a world-class wine producing region that specializes in aromatic white varieties like Riesling and Gewurztraminer and cool-climate reds like Cabernet Franc and Pinot Noir. Wine tasting is at your own cost. Another fantastic waterfall, Buttermilk Falls. Its name is taking from the foaming cascade formed by the Buttermilk Creek as it flows down the steep valley toward Cayuga Lake. Buttermilk Falls is the largest of 10 falls along the Creek as it plunges 600 feet to the valley. This is another amazing State Park with numerous waterfalls. It is an area of wild beauty, with the rugged gorge called Enfield Glen as its scenic highlight. Winding trails follow the gorge past 12 waterfalls, including the 115-foot Lucifer Falls. The total elevation change one way (ascending and descending) of the gorge trail is 1035 feet. A natural swimming pool with a lifeguarded swim area is located at the Lower falls; this fall is the most visible one in the park. If you don’t feel like hiking, this is a great place to hang out. At the park you can also explore an Old Mill that was built in 1839 and was the center of the former hamlet of Enfield Falls. There are great interpretive panels about the milling process and an informative video. ShequagaFalls Park is also known as Montour Falls. This is a 165-foot waterfall located in a suburban neighborhood. The falls are easy accessible by a short walk. We anticipate arrival back to NYC at approximately 7:30 pm on Sunday. BAGS: We have limited space in our transportation vehicle. Please don’t bring more than one small to medium size suitcase or duffel bag and one small backpack for day tours per person. 22 – 60 days before departure - Loss of deposit. 7 days or less before departure - No refund or tour credit.